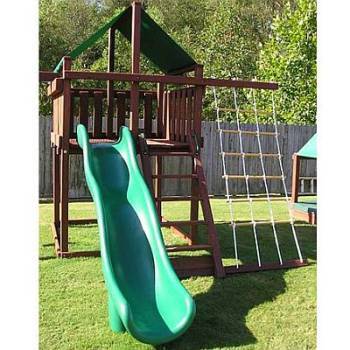 The Trailblazer Swingsets have a 6' x 6' Fort with a deck height of 5 feet. The Trailblazer's dimensions are 6' wide x 9' long x 10' high (6' x 14' x 10' with slide). It's designed for children under the age of 12 and can support over 250lbs! All-bolt construction, 4x4 framing, and other strengthening features are used to insure the strongest, sturdiest Do-it-Yourself playset. 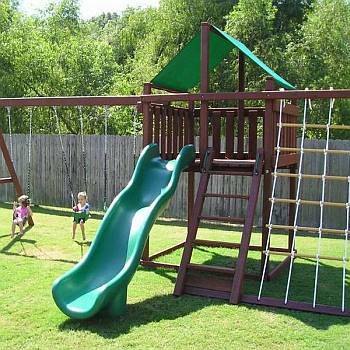 Anchor rods and/or supports are never needed with these swing set / fort kits. The ladder steps are wide and flat, designed around our powder-coated 14 gauge brackets (hardware included). Each kit has an easy to follow 3D illustrated manual which includes a lumber purchase/check sheet. 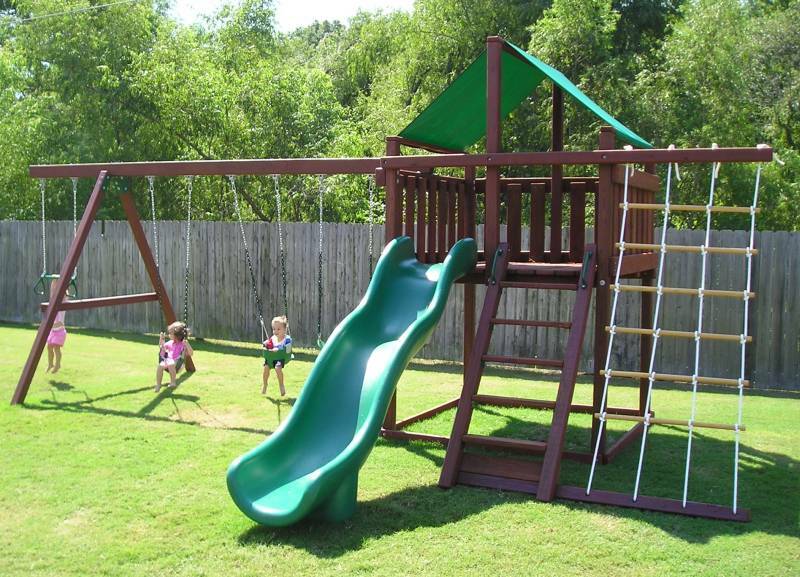 These unique, one of a kind, wooden swingsets / fort kits are solidly designed and engineered. Their unique design and Bolt-Thru construction offers exceptional strength and requires less lumber and less time to construct. The Trailblazer Swingset is a perfect do-it-yourself swingset project. With a little patience and a few hand tools, you can build your own Trailblazer swingset for your children. Approximate basic cut/drill/assembly time is 16-20 hours. Selecting and purchasing the wood, routering edges, sanding and paint/stain/seal will add time. Lumber is NOT included. Lumber costs for this kit are approximately $450.00 - $600.00 using #2 pressure treated pine depending on where you live. You can use most any type of wood you choose. Check with your local lumber professional for wood types and pricing. Click here for the Trailblazer Swing Set Wood List. 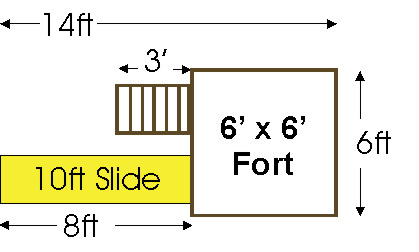 Step-by-step 3D illustrated manual to build the Trailblazer Swing Set / Fort with sandbox bottom, 3 swing position swing beam and A-Frame support assembly. Small/minor adjustments can be made to turn it into 2 swing or 4 swing model. One (1) removable marine grade vinyl canopy tops in your choice of Green or Blue. 3' x 9' Rope Ladder with six stained 1-1/4" hardwood dowels and four 1/2" nylon ropes. Exchange one or more swings for a different type of swing: Disc, Buoy Ball, Glider, etc. The Trailblazer has a 5ft high deck for a ~10ft slide, which is sold separately. 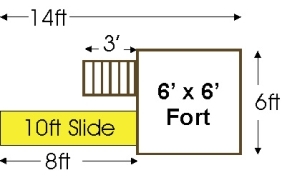 See our Playset Slides selection. Customize your Trailblazer Kit with our Swing Set Accessories. Add steering wheels, periscopes, telephones, a rock climbing wall, and more.